Here in Eastern Ontario, we’ve been experiencing crazy weather with extreme temperature swings. Maintaining a consistent feeding program is important to help our horses stay consistent in their gut health. 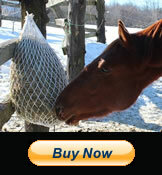 Add some extra hay to their nets in the coldest weather. This will help keep them warm as they digest their hay, but remember to back off a bit when the weather swings to the warm side again.